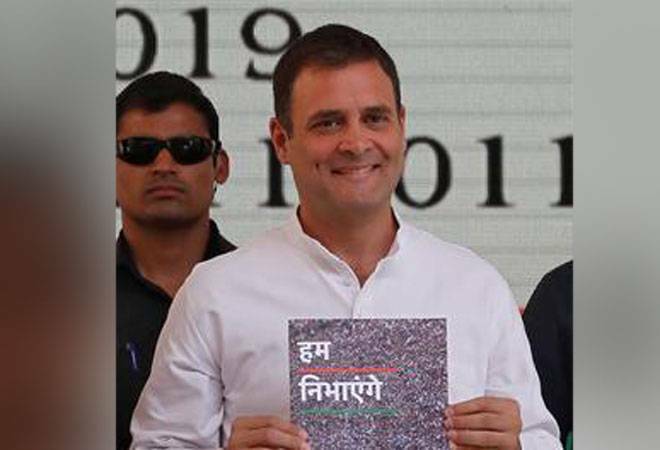 The Congress on Tuesday released its manifesto for the 2019 Lok Sabha elections and emphasised on creating globally competitive large banks through merger of small banks. The manifesto speaks of amalgamating two or more Public Sector Banks (PSBs) so that there will be only 6-8 state-run lenders with a national presence and adequate capital. The central government recently carried out a three-way merger between Bank of Baroda, Vijaya Bank and Dena Bank as a test case, which came into operation with effect from April 1, 2019. The objective is to bring down operating cost and improve operational efficiencies while strengthening risk management practices. The Congress party, in its manifesto, promised a “comprehensive review of banking system”, including role and functions of Public Sector Banks (PSBs) in order to make them robust, competitive, healthy, efficient and profitable. “PSBs will continue to implement policies to serve the larger public interest including lending to priority and other disadvantaged sectors that are denied adequate credit,” it added. Blaming the Narendra Modi-led NDA government for weakening the banking sector in the last 5 years, the Congress said there has been a sharp rise in non-performing assets; crony capitalism has thrived; and deserving sectors and individuals have been denied credit. Congress promises to reverse these developments, said the manifesto. The Congress in its manifesto promises to abolish the “redundant” Banking Board Bureau (BBB), which was set up by the Modi-government to improve governance in public sector banks. BBB was started in 2016. Raising concerns over the recent failure of some non-banking financial corporations that has affected the bond market, mutual funds and the flow of credit, the Congress promises to review and strengthen the regulatory regime of NBFCs in order to prevent such failures and to restore investor confidence.The Congress also affirms to take the necessary policy and administrative measures to develop a robust, deep and liquid corporate bond market, municipal bond market and infrastructure investment trusts. Taking cognisance of banking scams during Modi regime, the Congress promises to take hard measures to prevent fraud in the banking, securities and financial markets (including money collection schemes) and deliver swift and deterrent punishment to offenders. In order to provide long-term credit to development and infrastructure projects, the Congress proposes to promote new Development Banks. It will also encourage the establishment of state-level and regional-level institutions, including small banks, to provide bank credit to MSMEs. Rahul Gandhi, in its manifesto, promises to strengthen and technologically-enable “Regional Rural Banks and Banking Correspondents” to accelerate financial inclusion so that citizens are provided banking services in their neighbourhood. The Congress also intends to work with the RBI to simplify the Know Your Customer (KYC) process, avoid repetitive verification, and use a wider range of documents for the purpose. Among others, it promises to take necessary measures to develop a deep and broad securities market that will offer products that will attract more investors to the securities market, give them safe and adequate returns and offer investment solutions to their long term needs.